Built 1981 as "Staatsteater"/"State Theatre" by Hans Botha and Roelf Botha. Later renamed "Spoornet State Theatre" after the railway company Spoornet that sponsors the theatre. The complex houses several theatres - Opera House (1327 seats), Drama Theatre (712 seats), Arena Theatre (250 seats), Rendezvous Theatre, Monumentum Development Theatre, Studio (150 seats) - as well as several function rooms and rehearsal rooms. Used for opera, musical, ballet, drama, and cabaret performances, concerts, conventions, and balls. Home to the South African Ballet Theatre, the Black Tie Ensemble (performing classical vocal music including opera), The Pretoria Youth Choir, VMMDF (Vusi Mahlasela Music Development Foundation), SSTEP Music School, YET Youth Empowerment Trust, and the South African Ballet School. 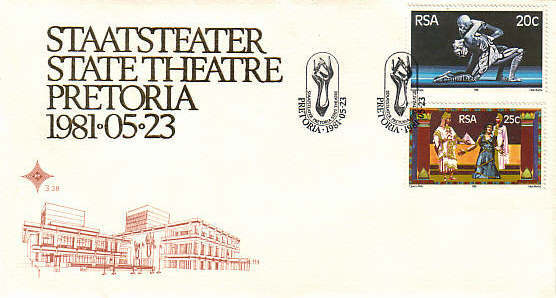 Text: "Staatsteater - State Theatre - Pretoria - 1981-05-23"
Stamps: "Ballet Raka", "Opera Aida"
Postmark: "Staatsteater - Pretoria - State Theatre, Pretoria, 1981-05-23"